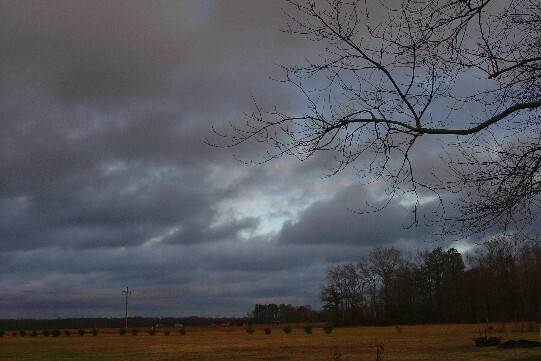 As Friday faded the storm warnings were out across the state. Many folks were out trying to get the last of their Christmas shopping done. I know, I was out there right with them coming home very late that night after work. What was to come was cold, rain, wind, snow, wind, ice, wind, and more wind. Living in the eastern part of the state near the coast, I knew snow was an unlikely possibility the way the storm would track and the temperatures were going to be too warm, but it was the wind that would be a real threat. The rains fell and heavily over Saturday night and began to blow away come mid-morning. The sun rose but didn't shine, simply brightening the dark gray that pervaded the day with the ominous, melancholy cries to come. That very large, very old sugar maple that hangs over the house began to creak and moan by noon. You wouldn't have known it was noon, but the clock said it was. The day remained dark as the winds began to gust beyond the steady gales of 25-30 mph. By 3 PM, the winds had long since dried the roads and everything else, the gusts were pushing 40, 45, 50+ mph. The screens on the back porch began to emit that chilling scream that screens often do when the winds crank up. Saturday morning I'd run around in the yard and about the house to put way anything that might blow away. Even so, certain things shouldn't topple but did on Sunday afternoon and I was out chasing them down. It was time to be home and cozy, grateful for my home and the warmth found within. Today was a day for warm breads, pumpkin. A big pot of soup of ham and bean, with and hot biscuits laden with real butter. Hubby was curled up in his worn, aging recliner, feeling all the torment that the weather changes can bring him. The rest of the house was mostly quiet as the washer chugged along as I was bitter about having to use the dryer. In monster gales such as this, I don't even try to use the clothesline, although I have in the past. I've learned that if you put blankets, and heavy linens out on the line on days like these, even the strongest of clotheslines will snap flinging your freshly washed linens into the muck. Within the house, candles glow and the quiet pervades. Even the teen is quiet. It's a rare day, one to savor. The chores are inevitable. Yet the appreciation of a warm, safe shelter in the face of a screaming gale is very appreciated by me. If you haven't thanked your home, be it great or small, be thankful. Mine's a tiny little place and I cherish it for all the memories we have created within its walls and the protection it's given us. Keep safe out there and know that Dorothy's truism is apt: "There's No Place Like Home!"